High Power Electromagnetic Pulse generation techniques and High Power Microwave technology have matured to the point where practical E-bombs (Electromagnetic bombs) are becoming technically feasible, with new applications in both Strategic and Tactical Information Warfare. The development of conventional E-bomb devices allows their use in non-nuclear confrontations. This paper discusses aspects of the technology base, weapon delivery techniques and proposes a doctrinal foundation for the use of such devices in warhead and bomb applications. The article	at the above link goes into great detail on how to make the EMP bomb, not that I recommend building one. Just that one can gain an understanding of mechanical generation of high powered short duration plasma pulses. Seems to me the subject fits right in with CMEs and such. Speaking of EMP generators, the old high-altitude Pacific nuke shots were seen to disturb the magnetic field, measured at Castle Rock magnetic observatory, by about 60 nanoTesla. Just like a nice CME! Incidentally, if you study the Saturn-Enceladus arrangement, exactly the same discoveries are being made. Flux tube between poles of planet and moon (the southern circuit is so far not observed), plasma torus within which the moon revolves around the planet, ionization and electric discharge machining and ejection of the moon's surface into its ionosphere and torus, hot spots where flux tube contacts moon (and planet), high energy charged particles in motion in flux tube... and these are half of the 4 ringed gas giants in our system. Expect more, and possibly similar, discoveries in years to come. At least that would be my interpretation. Last edited by nick c on Mon Sep 24, 2012 8:42 am, edited 2 times in total. Yes, that does look more like lightning. All the news is about an impact event but there is zero evidence for that. What is interesting is in quick stop/play mode, you'll notice a disturbance in the atmosphere immediately before the initial flash. You'll also notice the large central flash in the center occurs at the same time as the small semi-spherical outer edges. There also appears to be no activity in the area between the simultaneous flashes, and nothing at all appears in the bottom left quadrant. My guess is that it will be found to be another signature of the electromagnetic interactions of Io with Jupiter. There are UV bright spots at Io's equator and we could be seeing their counterpart on Jupiter. Note that If I didn't get into a mess with Celestia, this event was approximately at the projection of Io over Jupiter. Of course this is only a veeeery speculative hypothesis, but I couldn't help saying it. I believe from viewing it several times that the ionization and brightness, with the spider web like structures, originates from within the atmosphere. There is no impactor present, which would be, itself, a streaking ionized structure visible on approach and upon impact. No such thing exists in this footage. Instead the structure behaves and looks more like lightning. It does not look like Shoemaker/Levy. Also, the structure seen is probably as large as the Earth. are gas giants really gas giants? 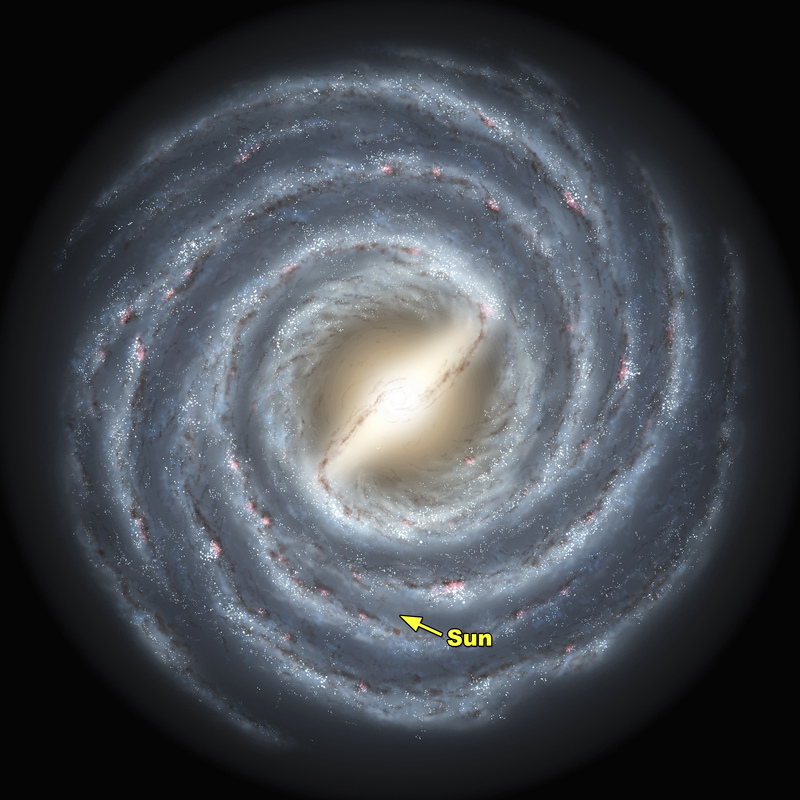 The conventional model of the sun is that it's a big ball of gas, and this model extends to the giant planets to say they are, for most of their radius, gas. Only a small central core of these bodies is thought to be rocky. In the electric model of the sun, its often suggested the sun has a solid surface much closer to the visible photosphere surface of the sun. This suggests that the giant planets have much larger rock core, and have much smaller gas atmospheres. What do you think? What have you read / heard about this? Perhaps a very sturdy probe could be sent through the atmosphere of a giant planet and we could detect it hitting a surface? Here's Thornhill's model of the Sun at http://www.holoscience.com/wp/our-misunderstood-sun/. He has the heavy elements core below a 200,000 km thick atmosphere and photosphere. 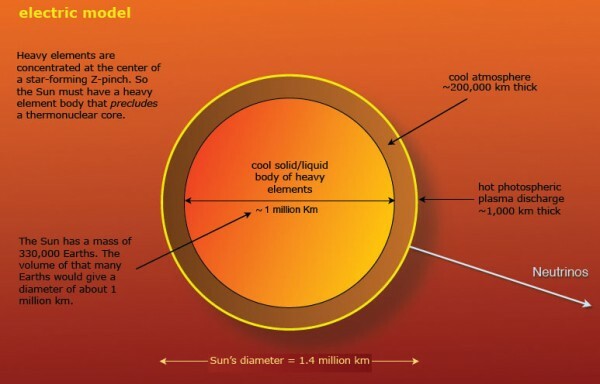 Charles Chandler's model has a similar core under a thick liquid hydrogen/helium layer and a thinner atmosphere. Brant Callahan's model has a hollow core under a 200,000 or so km solid iron shell under about a 700 km thick photosphere. Here http://holoscience.com/wp/twinkle-twinkle-electric-star/ Thornhill says as follows. An electric star is formed by the equivalent of a lightning bolt in a molecular (plasma) cloud. Just like earthly lightning, cosmic lightning scavenges, squeezes and heats matter along the discharge channel. Where the squeeze is most intense, the current may ‘pinch off’ to give the effect of ‘bead lightning.’ In high-energy plasma lab discharges researchers have found that hot plasma ‘beads’ (known as plasmoids) form along the discharge axis before “scattering like buckshot” when the discharge quenches. Another important phenomenon known as ‘Marklund convection’ occurs along the discharge axis. It separates the chemical elements radially. Marklund convection causes helium to form a diffuse outer layer, followed by a hydrogen layer, then oxygen and nitrogen in the middle layers, and iron, silicon and magnesium in the inner layers. So electric stars should have a core of heavy elements and an upper atmosphere mostly of hydrogen. This renders the difference between stars and planets to be more apparent than real. In addition to scavenging elements, stars produce electrically in the high-energy electrical discharges of their photospheres all of the elements required to form rocky planets. Nucleosynthesis of heavy elements does not require a supernova explosion. Planets are then born by electrical expulsion of matter from the body of the star in the form of giant mass ejection events, like we see in miniature in solar outbursts. Large stellar flares and nova outbursts probably signal the birth of planets. Disks of matter encircling stars are not due to gravitational accretion but to electrical expulsion. Here, http://www.holoscience.com/wp/the-dragon-storm, Thornhill said this. Like Jupiter’s Great Red Spot, the dragon storm on Saturn seems to be a long-lived storm center that occasionally flares up. The clock-like regularity of the radio emissions from storms on Saturn is used to judge the great planet’s actual rotation rate beneath the clouds. But this behavior is enigmatic. Why should an electrical storm attach itself to a particular spot on a planet’s surface, particularly when that surface is thought to be liquid? The Electric Universe model of stars and planets provides the possibility of a solid surface on the giant planets. And as we find on Earth, a solid surface allows for regional electrical differences that favor electrical storm activity in one region over another. A good example is “tornado alley” in the southern U.S.A. The Electric Universe accepts the plasma cosmology version of star formation, which postulates that a star is formed in a ‘z-pinch’ in a galactic electric discharge. It is a model that can be shown experimentally to work. They are not gas balls but rocky objects with a thin yet dense atmosphere. Remember Comet Shoemaker-Levy in 1994 we all watched as it broke up into many pieces and impacted the 'gas giant' Jupiter? Each impactor fragment, about 9 total, made big splashes, crater-like marks on Jupiter which persisted for several revolutions of the planet. This is not what we would expect if Jupiter was simply gaseous. What we would have expected is that the comet fragments would have been immediately swallowed up without a trace. The fact that they instantly left big marks shows without a doubt they hit a solid surface. The reason NASA did not react to this, imho, was that too many theories, people, books, and courses would be overturned in that case because all the above had already said that Jupiter's density was far too low to have a mostly solid body. I like Thornhill's idea that gravity and/or mass is not a constant and is related to electric charge and will throw off density calculations. To me, the salient thing is that the impactors left permanent marks and therefore proves there is a solid surface. This also goes for all the other permanent localized features of the 'gas giants' like the great red spot on J and many others. 4Real said: Remember Comet Shoemaker-Levy in 1994 we all watched as it broke up into many pieces and impacted the 'gas giant' Jupiter? Each impactor fragment, about 9 total, made big splashes, crater-like marks on Jupiter which persisted for several revolutions of the planet. ... To me, the salient thing is that the impactors left permanent marks and therefore proves there is a solid surface. We ought to look up the timing of the observations of the SL9 impact events. If we can find out what time each or any fragment arrived at the top of Jupiter's atmosphere and what time the discoloration of the atmosphere occurred, we may be able to calculate at what depth the fragment exploded. Meteor explosions occur within Earth's atmosphere, which EU theory attributes to electrical forces, so it's very possible that the SL9 fragment explosions also occurred within Jupiter's atmosphere. Anyway, we may learn something important if we can determine at what depths several or all of the fragments exploded. I don't know why radar has not yet been used to determine the depths of the gas giants' atmospheres. I believe radar was used for Venus before landers were sent there. If the gas giants were previously brown dwarf stars, they may have supercritical fluid surfaces below their atmospheres, since that may be the case with the Sun, and some of the planets may formerly similar stars. The Sun gives off mostly blackbody radiation, which seems to be possible only from solid or supercritical fluid bodies. Lloyd wrote: I don't know why radar has not yet been used to determine the depths of the gas giants' atmospheres. I wonder if preconceptions have prevented NASA even considering that there could be a surface to look for beneath the gaseous outer atmosphere. It seems that they may have tried to get a radar image of Jupiter like they did Venus, but Jupiter is said to have too much radio noise to get a good radar image. The same may be true of Saturn. I don't know if they tried and failed, or if they didn't try because of the assumption that it wouldn't work. You took the words right out of my mouth. I was in the process of posting the same thing you just did, about the S/N problem for radar, when I saw your post just as I logged in.